Darrell Issa's folly has been billed for days as the hearing that would blow the top off the alleged Benghazi cover-up. Or something. The leaks of the expected testimony of the very important whistleblowers were breathlessly touted as the bombshell that was going to drive Obama from office. The crackpot con echo chamber could hardly contain its excitement. And then the hearing happened. 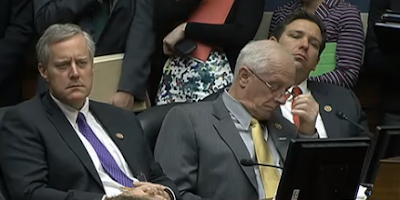 As you can see the committee was riveted. Appears this didn't go exactly as planned. To begin with their star witness with the very important title, Deputy chief of mission for the U.S. in Libya Gregory Hicks, seems to be mostly a glorified office manager with many responsibilities but little authority. Hick's pumped up bio is full of important sounding titles, but if you click through to the interviews his 22 years of experience seem to consist of ceremonial duties and shuttling messages between the actual negotiators. That aside, the hearing was a bust mainly because it revealed nothing new and more importantly the testimony debunked the GOPers crackpot conspriracy theories. I leave it to Charlie Pierce to explain why this failed witch hunt feels all too familiar to those of us who remember the 1990s. Meanwhile, while it's tragic that these four people died in Benghazi, a little perspective is in order. 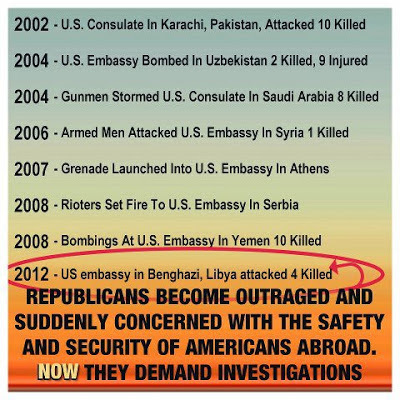 As someone on the twitter said, if only there was a way to compel the GOPers to explain to the American people why these four matter and all those others who died in attacks during the Bush administratin were never even mentioned.